Simply provide us with your list of special occasions you wish to be reminded of and we won't let you forget them. Our staff will be happy to notify you of special dates or occasions by email, standard mail or phone. Call today and give us your list, or register online and set up your reminder service today! We won't let you forget another special day! 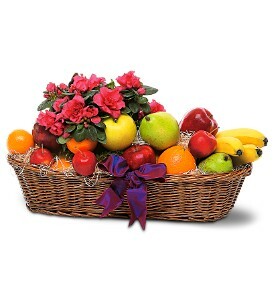 There is always a reason to give a gift from Gellings Floral Designs. Whether you are celebrating a holiday or joyous event, extending your heart felt regrets or sympathies, or merely saying "I thought about you today", Gellings Floral Designs can help you express yourself with a level of elegance and sophistication or with fun and whimsy, you decide. We guarantee your thoughts will long be remembered and greatly appreciated. You Deserve Flowers and Flowers are "good for you". If you buy flowers only for others, and only for special occasions, you're missing an opportunity to pamper yourself with a little well-deserved self-indulgence. SAF, Society of American Florists, research has proven that "flowers decrease depression", "refresh recent memory and have a positive impact on human emotions and well being". It's easy to bring a spot of elegance and color to your desk, bedside stand, or kitchen window sill, and the difference that bit of hue and fragrance can make in your life is almost indescribable. In fact, we think that once you've surrendered to the experience of treating yourself to Gellings Floral Designs, you'll find it hard to imagine your personal space without a few well-chosen stems close by. The Gellings Floral Designs bride may be secure in the knowledge that her flowers will be custom designed to fulfill all her dreams. The season, the atmosphere of her wedding location and her own personal style will all be considered in the plan. Following an individual consultation, she will work with a floral designer who will follow her wedding plans from conception to reality. Gellings Floral Designs takes special care to add those highly personal touches that will create a wedding day for a lifetime of memories. See our Weddings section for more details. Gellings Floral Designs is known for providing unparalleled floral artistry to some of Monticello's most prestigious events. From simple parties to grand black tie galas, Gellings Floral Designs compliments memorable occasions with great style and grace. Beginning with an individual consultation with the designers of our Special Event Department, and every step along the way, your event is treated with the kind of attention to detail that you expect from the best. And we take special care to add those highly personalized touches that will delight you as well as your guests. So you're in the doghouse again. Exactly how mad is she? Do you need a beautiful bouquet (she's just a little mad), a gorgeous bouquet (she's mad, mad) or a magnificent bouquet (she's mad-mad-mad!). Our designers at Gellings Floral Designs can help you select the appropriate bouquet you need for this most important occasion. Gellings Floral Designs outstanding fresh cut arrangements can be a beautiful accent to an office reception area, hotel lobby or retail establishment, delivered weekly in a variety of distinctive containers. We also offer unique plants to enhance your business space. SAF, (Society of American Florists), "Impact of Flowers & Plants on Workplace Productivity Study" proved that "problem-solving skills, idea generation and creative performance improve substantially in workplace environments that include flowers and plants." Gellings designers can create floral arrangements and decorations for any event, whether it's a corporate breakfast, annual board meeting or formal holiday extravaganza. Our designers can create floral arrangements and decorations appropriate for all types of corporate events. For the December season, Gellings Floral Designs can provide unique and creative holiday decorations for your office space, and our trained service staff can install and take down decorations as needed. 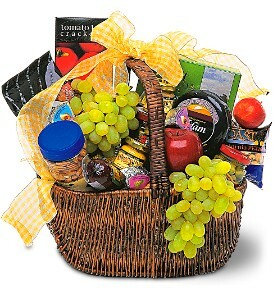 Unique and unusual corporate gifts are our specialty. The choices are endless. 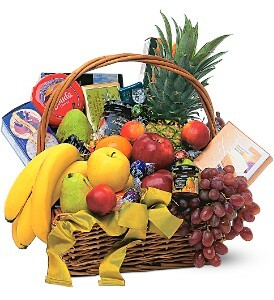 Bouquets, gourmet baskets and plants are just a sampling of the ideas. The special customer you want to thank for their business, the employee celebrating an anniversary with your company or a birthday will be more than pleased and surprised with your thoughtfulness. In choosing Gellings Floral Designs to design your Sympathy Flowers you can be assured that your sentiments will be expressed beautifully. Our signature baskets, casket covers, heart, cross and wreath designs are created with the freshest flowers of the season. Our design consultants understand the importance of your tribute and will personally assist you with flower selection as well as coordinating all of the details of delivery. We are well versed in the etiquette of all cultural traditions and have long established relationships with all area funeral homes and churches. 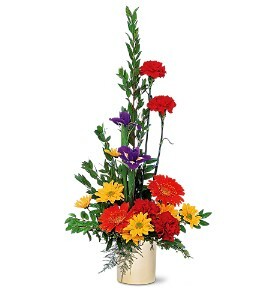 We are Monticello's leading sympathy florist. We have a special area set aside for your comfort. Our sympathy specialist will assist you in your selection. We carry an extensive line of crosses, hearts, and inspirational items to meet all your sympathy needs. Our special services team are experts in home decoration and entertaining. If you love fresh flowers in your home, we'll coordinate a consultation with our designers to create a floral environment that's tailored to enhance your home's interior design and deliver a custom fresh-cut arrangement to you each week. For special occasions or entertaining, Gellings Floral Designs creates floral arrangements and decorations for any social gathering, whether you're hosting a small brunch or a large formal party.